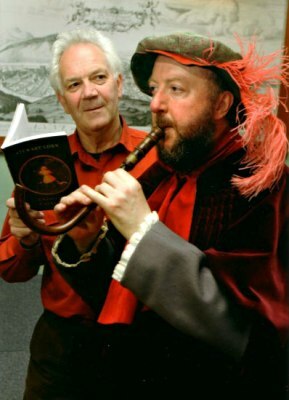 Long an admirer of poetry, John has in recent years collaborated with poets in performance, combining his atmospheric music with the recitation of the work of a number of poets. 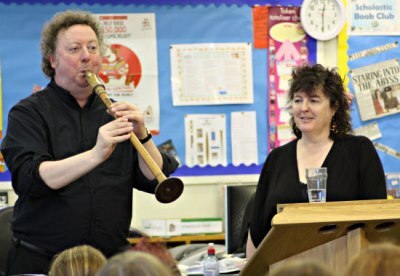 Two of these collaborations stand out - his extremely successful work with poet laureate Carol Ann Duffy, and his performances with Stewart Conn.
With Carol Ann Duffy and her daughter Ella, John has helped to create shows such as The Princess' Blankets, which has been described as "A magical blend of poetry, music and fairytale". in his hand, a hake. Surely, I thought, some mistake? Oh my! A zoo! An elephant! A giraffe! sprawled on the sweetie shelf. growing up, growing up in Wick.